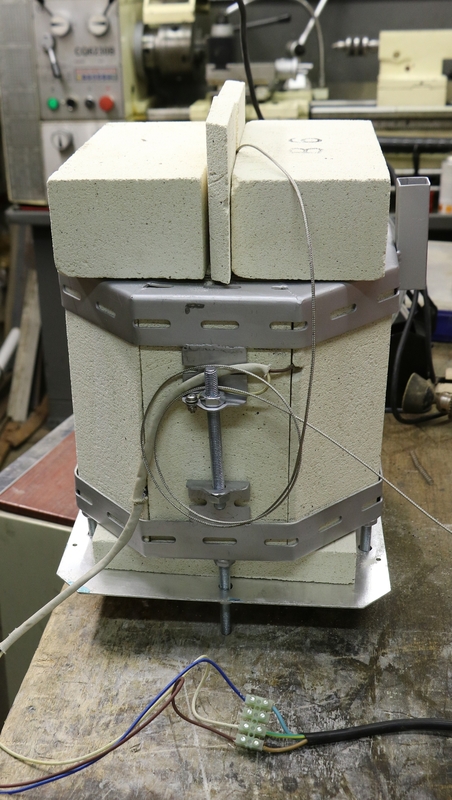 10 insulated furnace bricks – come in boxes of 5 at about £26 a box. Electrical heating element – various sizes available, around £5 from China – takes a while to get so get two while you are about it! PID controller – from Ebay, get a 1000 degree C one from INKBIRD – mine is model ITC-100VH with a 40 Amp Solid State Relay (SST-40 DA) and a K type thermocouple. It should come with a K type 1000 degree one but mine came with a 400 degree sensor. 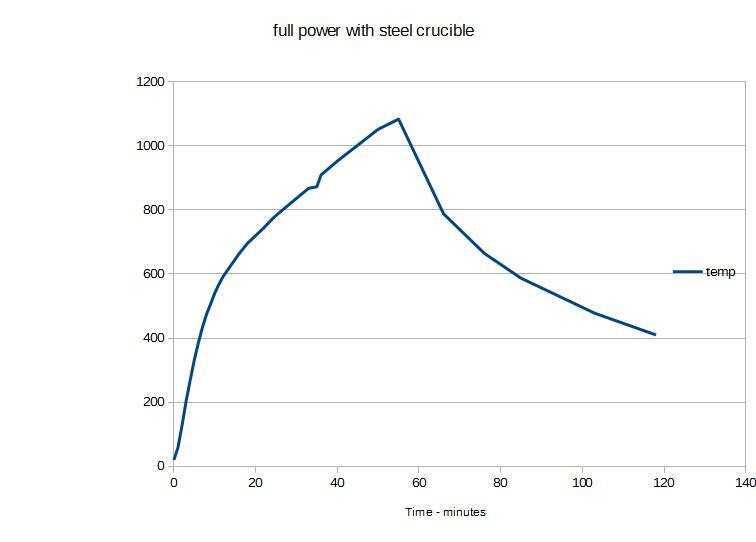 A 25 Amp SSR would be fine. Heat resistant wire ( Glass insulation necessary) wires from an old cooker are ideal! Double pole 20 Amp mains switch and mounting box. 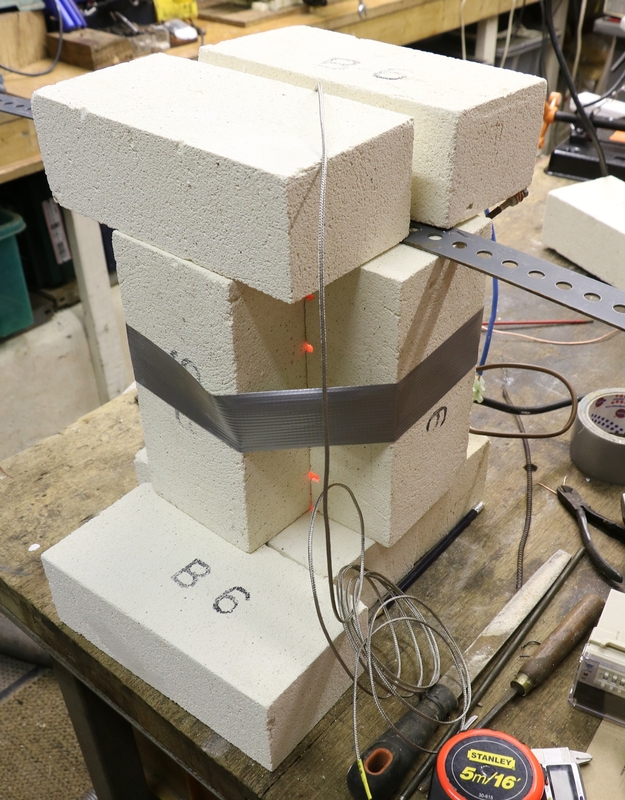 Angle strip and bolts for framework – ideally you should have access to a welder – if not I’d consider using more bricks and making a rectangular shaped furnace so that you can bolt the framework together out of Dexion or Handy Angle or similar. 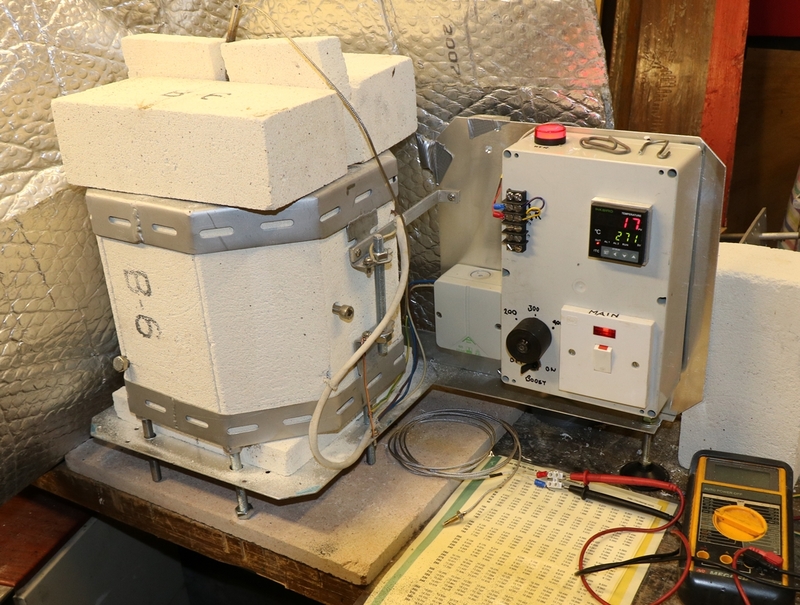 The videos tell you exactly how to make it, so I wont repeat it here – I wired mine up a little differently because I incorporated a temperature controller from an old cooker that I can switch into the output to allow me to put a bit of heat into the furnace as it starts to cool. I will also include a switch to disconnect the output of the SSR so that the PID controller can continue to show the temperature while its not heating – you can do this by turning down the temperature on the controller, but that is a slow process – there is probably also a way to turn its output off , but its a bit fiddly to set so I prefer a simple switch! 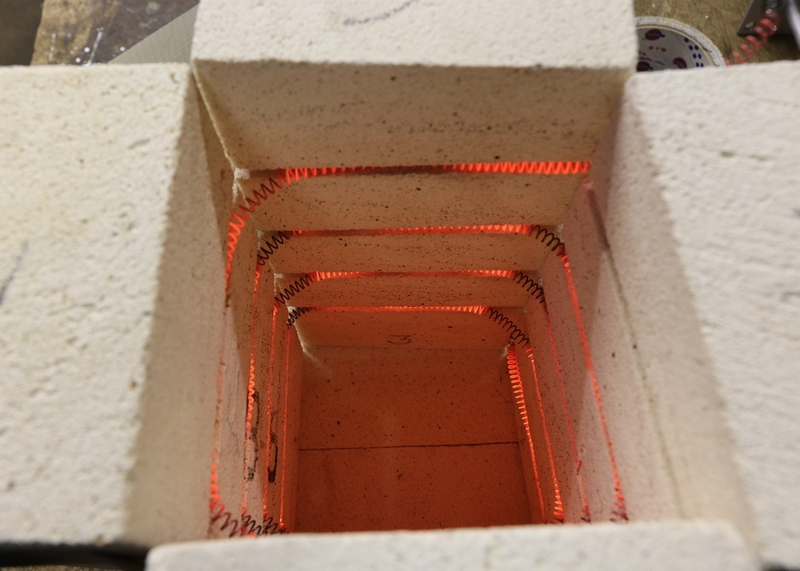 It’s a bit of a fiddle getting the element in place – it does sometimes pop out – make sure any metalwork you put inside the furnace is earthed, including the sheath of the thermocouple! Frame fixed and wired for an uncontrolled test using a millivolt testmeter and a table of K type thermocouple output voltages to measure the temperature – it got up to almost 1100 degrees C in around 60 minutes before I switched it off. Mains switch, cooker control, PID controller and thermocouple terminals ( so I can check the voltage/temperature) mounted on a old plastic box on an aluminium panel – It is IMPERATIVE that everything is very firmly bonded to earth, including each bit of the frame, the aluminium back plate and floor plate, the thermocouple sheath and any metal in the furnace, and that the unit runs off a socket protected with a RCD ( residual Current Device) either in the socket or on the consumer unit. (mine comes via 2 RCDs – it has been tripped a couple of times when the element has come adrift while heating and touched a metal pot hanging in the furnace – the RCD saves the element as well as the operator!) Stick rigidly to the rule that you unplug the mains BEFORE touching the unit and if you are not confident about wiring get someone who is to cast an eye over it. ‘The control panel’ is all insulated so you can operate the switches and PID while it is plugged in, and also read the thermocouple voltage – as long as its sheath is firmly earthed! One problem with heating iron & steel up above about 6-700 C is the scale that forms on the surface – it is difficult to remove, it is likely to spoil the finish and it changes the dimensions. There are two products that will sort this problem – stainless steel & titanium foil to wrap the part and crimp the edges to seal – some people recommend putting a small piece of some burnable material inside the package to burn up and consume any oxygen left inside – when I tried it I wrapped the part in a bit of brown paper and it worked fine. The other product is an anti oxidation paint called ATP 641 anti scale paint – both of these are available from Brownells – I’ve tried both, the paint is difficult to remove if you use it for annealing as it doesn’t come off very easily – I think it might be better for hardening, but I need to try sometime. Anyway I was pleased with the foil.